Despite a sub-par performance that saw a string of missed blocks and broken tackles, the Pirates junior team did just enough to secure the win and progress to the Northern Conference Playoff Game. Chester went 3-and-out on their opening drive and a short punt gave East Kilbride a decent starting position. Their ground game was pressed into action and a 6-play drive concluded with a 9-yard TD for Rory Hutton and a 6-0 lead from EK’s only possession of a brief 1st Quarter. One the opening play of the 2nd period, the Romans tied things up on a 13-yard run by QB Sam White. The 2-point conversion run was then stopped short to keep things level. On their next possession, a low punt snap saw Chester pinned back at their own 3-yard line before 2 plays later Jack Cochrane carried home for a 4-yard TD. He also ran in the 2PAT to secure a 14-6 advantage. A good kick return followed by a 15-yard penalty against the Pirates saw the home side immediately set to respond. However, a fumble on 3rd-and-goal was recovered by Declan Kelly to preserve the lead until half time. Both teams failed to convert on the 4th Down of their initial possessions before the Pirates finally strung together a coherent drive. The eighth play of a time-consuming series saw Cochrane carry home from the 36-yard line. The 2PAT would effectively have put the Pirates out of range, but the run was stopped short of the endzone, giving Chester one last chance to prevent defeat. However, with time at a premium, they had to go to their passing game and a Garry Speedie inteception allowed EK to take a knee and calm the jangling nerves on the sideline. 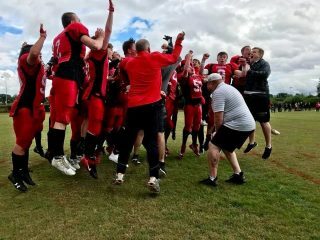 East Kilbride will travel to face Manchester Titans on August 12 for the right to represent the Northern Conference in the 2018 Bowl Game. The Pirates will also be out for revenge as their only loss of the season came at the hands of the Titans.